Who is Joe D? I am many things depending on who you ask. I AM A RUNNER. A very motivated, positive oriented runner who now enjoys more than anything else to help others achieve their own running goals and objectives. How did it all start you ask? Ask Nancy and she will take some of the credit, as she should. However, the running bug began for me when I picked up my brother-in-law John after he ran a Turkey Trot. That motivated me to run with my friend Paul and train for our first race together; a 10k for Hospice Buffalo. Early in the race the car that follows the last runners was nearby to our surprise! Looking back, it would have been ok if I was last. To finish was the ultimate pride and joy. I ran the popular races including the Shamrock Run and Turkey Trot. I found running to be a way to get in shape and reduce stress. 1994 is when running began to be a very important part of my life. I ran the 4-person relay at the 1994 Buffalo Marathon. At the finish line I waited for my teammate to finish the race; what I was exposed to was one runner after another finishing the entire 26.2 miles! I saw exhaustion, yes, but I also saw the pure joy and raw emotion each runner felt when crossing the finish line after 26.2 miles. I wanted that same joy, that sense of accomplishment. The first thing I did was read The Complete Book of Running by Jim Fixx. It was that book and Runners World that I used as my basis to develop a training plan to run the 1995 Buffalo Marathon. My training started 1/2/1995, it covered only 201 miles with 18 being my longest. My first marathon I finished in 3:59:21 without proper nutrition! I fell in love with the experience. Running marathons became an annual love, with 1998 being the first of several years I ran 2 marathons a year. 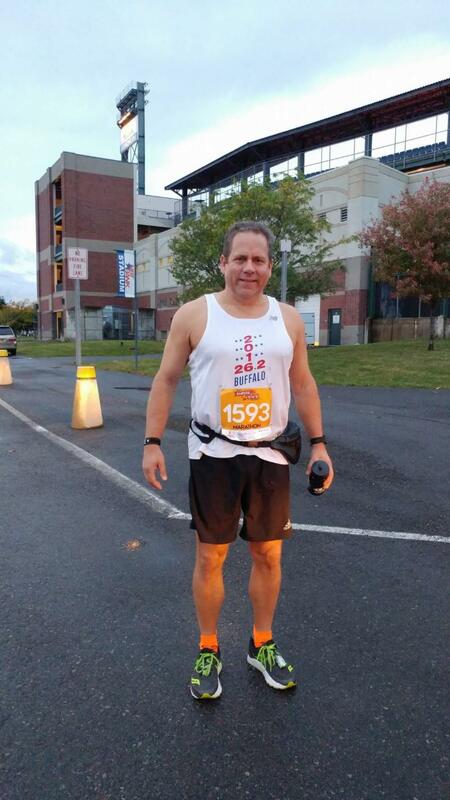 October 24, 1999, I ran a 3:22:04 at the Casino Niagara International Marathon, 7 minutes off a Boston qualifier time. So close….. In the spring of 2003 I discovered that Fleet Feet had a Marathon Training Program. I joined! It was a great program. I ran with my brother-n-law Dan and met so many wonderful people. I ran a 3:29 in Columbus with my Fleet Feet friends alongside. I also participated in 2004’s Fleet Feet program. Life was busy, so running took a back burner. Sure, I ran a marathon almost once a year, but my times were longer as my waist became larger! Fast forwarding to August of 2016, I searched out Fleet Feet. I wanted to run with a group, I knew Fleet Feet, so what could change in 12 years. The owner, the staff, but the Fitlosophy was very similar. The motivation to run by myself was gone. I WANTED TO RUN FOR FUN! I began to run with the group during the Monday and Wednesday social runs. I participated in Ton of Fun and the Winter Warrior programs in 2016-17. I slowly began to meet people, the staff. After a brief health scare which took me out of the running routine during February and March of 2017, I jumped back in and ran 2 times a week with Fleet Feet. What came next was unexpected; I volunteered to be Pace Leader in the fall training program and LOVED IT. I began to know some wonderful people who I am proud to say are my friends. The joy of helping another reach their goals are second to none! I guarantee I have gotten more out of being a Pacer than I can explain. I am currently Pacing my 3rd session in a row! ALSO, I am training for the Cleveland Marathon which I plan to crack the 4 hour mark for the first time in over 10 years. As I get older the Boston Marathon qualifying times become a little more attainable for me. So if I don’t hit a 3:30 this year or next, it jumps to 3:40, so who knows. I have the best of both worlds! My advice to you is just run, 1 mile or 26.2, because its more than just the running, it’s the people and the Fleet Feet STAFF who make it great!